Sorry it’s been so long since you’ve heard from us. We have been working hard trying to translate all the data that we collected into something simple to understand and excessively useful for bus riders in Dhaka. We started with the fairly complicated map of the bus lines - already clustered into fewer lines based on their general direction e.g. north-south, east-west and mapped topologically to the exact geographic coordinates of Dhaka. 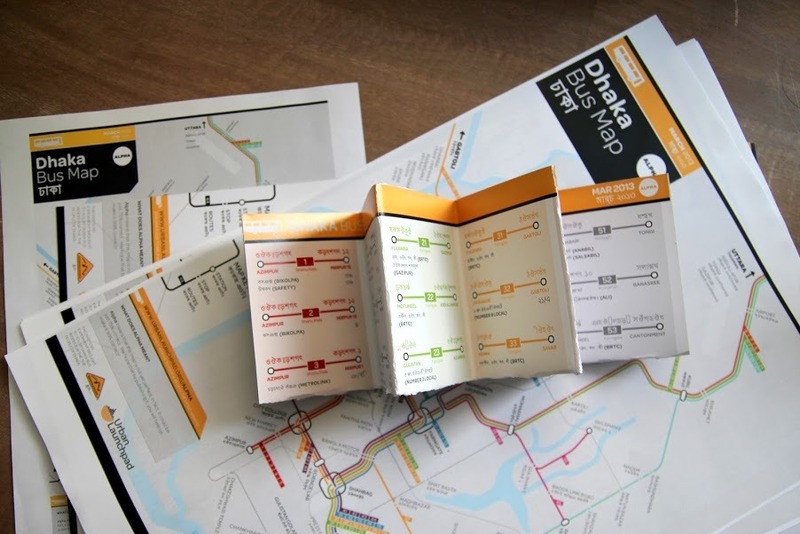 When we showed this prototype to our partners, they quickly and strongly told us that we needed to make something simpler, something more like a New York City subway map. So we went back to work and came up with our almost-printable map below. 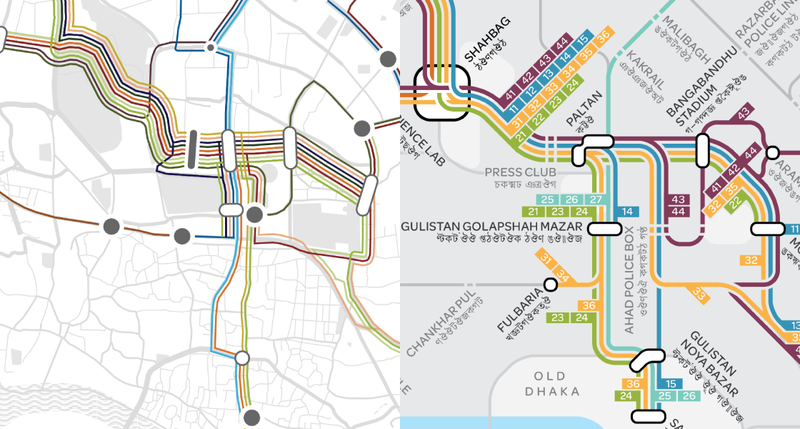 Since we want to make sure this map works for our intended audience of bus riders in Dhaka, we are going to wait to hear from our on-the-ground print distribution before we show you the complete first version. We have been busy preparing for the soft launch in Dhaka for the next few weeks but there have been the usual hartals (city-wide protests that keep most people off the roads) and the unusual natural disasters (20 people died from a tornado southeast of Dhaka). We did want to tell you a little more about this design itself, in case you had any feedback. First, we are calling this version alpha and being clear that this map is only 75% correct. We are opening a sign-up list to gather a local flock of evangelists to help bring the map to 99% and to help us keep updating the map in the future, since the system is likely going to change. Second, we moved toward a more diagrammatic rendition of the bus network that would primarily display the entirety of the system in relation to the key locations in the city, as opposed to geographic accuracy. (Eddie Jabbour, designer of the NYC Kickmap, has a great read on the differences between topographic and diagrammatic versions of the New York City subway map).We did do some mental map experiments in Dhaka and tried to mimic a bit of how people from Dhaka saw their city (thanks Kevin Lynch from MIT!). Based on these mental maps, the team felt that topographic accuracy was less important, and people would understand the system more clearly based on labeled location names. A diagrammatic approach provided far more flexibility in terms of spacing lines and labels for readability. Third, while we would’ve loved to use the official route numbers, we found that not every route had a number and those that did, rarely had them on the buses themselves so they were not always known to riders. Instead, we used roman numerals (instead of the Bangla numerals in which the official route numbers are listed) to re-number and re-cluster the system. This perhaps took us the longest but we are hoping this will make it easier for someone to quickly understand the many lines moving through the city. Finally we, designed this map to print at A3 size (a little larger than a tabloid sized sheet) and be foldable so that it could be easily fit into one’s pocket. We will keep you posted on how the initial distribution goes and thanks for all your patience and support! Right now, the Kewkradong team is busy translating all the English labels into Bangla and coordinating with the local printers.Once the initial launch happens in Dhaka, we can also begin to fulfill our supporter rewards for you all and begin concepting designs for the other elements of the bus infostructure so that they relate to the design of the bus map. I like it - the diagrammatic maps looks good with good contrasting colors. Looks like you're using Arabic numerals (1,2, 3) not Roman Numerals (I, II, III). Maybe this will push the operators to put the numbers on their buses!